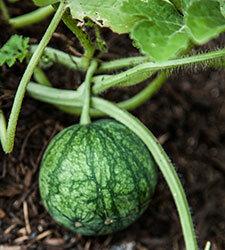 Big, fat, juicy homegrown melons are intensely fragrant and flavorful, and quite satisfying to grow from seed. Plant seeds in rich soil, make sure they get lots of sun and water, and give them plenty of room to grow! When you grow heirloom melons, save the seeds for next year's crop! Learn more about seed saving through our Just Seeds Initiative, and learn water conservation techniques for thirsty summer crops in our upcoming Water Conservation gardening class! 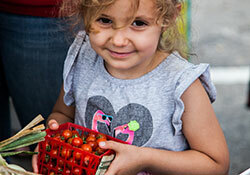 The SFC Farmers' Markets are bursting at the seams with summer fruit, tomatoes, squash, and so much more! Visitors to the market last week enjoyed our new summer layout in the park, with vendors extending all the way to 5th Street. To make exploring the market even more fun, we're organizing a scavenger hunt. Ready to play? On Saturday at the Downtown market, visit the vendors on 5th Street. Note five of the vendors on this side of the market in the comments on this Facebook post or pick up an entry form at the market info booth--all correct answers will be entered in a drawing to win a cookbook from The Happy Kitchen and a basket of juicy Texas peaches! They're spicy, sure, but there's more to chiles than just heat. 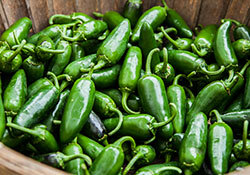 Underneath the tongue-tingling effects of capsaicin compounds, you'll discover layers of fruitiness (they are, after all, fruits), and sweet complexity along with the characteristic mild bitterness all peppers share. We love how customizable the heat levels are--just remove seeds and veins for less zing. In a classic case of "what grows together, goes together," you'll find that chile peppers of all types play very nicely with fruit. Peaches are plentiful now--ripe and juicy and fragrant--perfect for sweet and savory summer recipes. 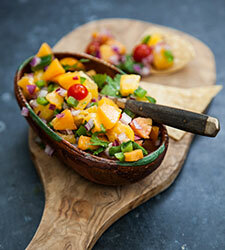 In addition to your favorite cobbler, pie, and ice cream recipes, give this easy peach salsa a try. You'll be spooning it over everything from quesadillas to grilled pork chops. Want more? We've got cooking classes coming up all about chiles & seasonal market fruit! You can also check out Joy making this recipe over on Austin Fit Magazine's Cooking Channel. Sweet! 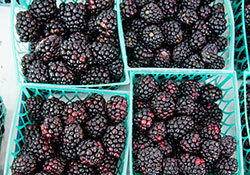 June marks our celebration of fruit at SFC Farmers’ Markets. 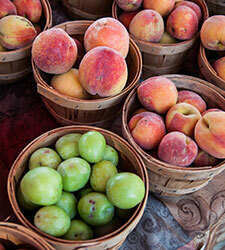 We’re reveling in an early summer bounty of peaches, plums, melons, blackberries, and strawberries. Want inspiration for your market finds? Visit our Peachy Keen, Melon Miscellany, Berries Black & Blue, and Sweet Strawberries boards on Pinterest. And if it’s happy hour in your world, you’ll want to take a look at Did Somebody Say Sangria? We love our market customers! 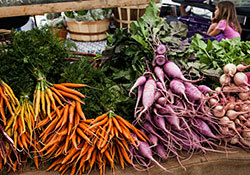 Saturday is customer appreciation day at both Downtown and Sunset Valley farmers’ markets. Come on out for goodie bag giveaways and lots of love!